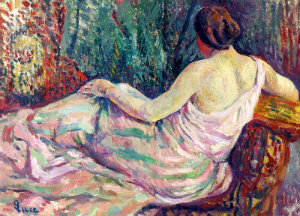 Maximilien Luce was born in a Parisian slum and grew up in grinding poverty. His impoverished upbringing made him sensitive to the plight of the poor and down trodden. He was a life long advocate for social justice and a bit of an anarchist. Later serving time in prison accused of radical activities. Inspired by his friendship with Georges Seurat, Luce started experimenting with divisionism and adopted the pointillist style. This unique style of painting is characterized by a methodical and scientific technique known as pointillism or divisionism. Pointillism painters juxtaposed small dots of pure color together to maximize luminosity. The dots appeared to intermingle and blend in the spectator's eye. During this phase of his artistic career he produced his greatest successes. He had no tolerance for racism and quit as President of the esteemed Société des Artistes Indépendants because of the Sociétés anti-Semitic ways.